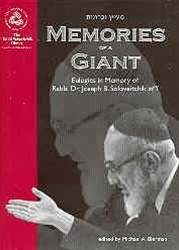 Memories of a Giant is a work about Rabbi Joseph B. Soloveitchik. Edited with great care and devotion, it seeks to depict "the Rav" to the thoughtful layperson through the very human and personal perspectives of members of his family, as well as devoted disciples. In addition to being a man of deep learning and powerful intellect, Rabbi Soloveitchik is presented here as a man of great chesed, profound personal piety and impeccable integrity. The eulogies (hespedim) collected in this volume, delivered by leaders of the Orthodox community, chronicle the impact of not only a brilliant philosopher and master pedagogue, but a caring, thoughtful and awe-inspiring teacher and role model.